Mount Barkers Chris Pavlovich has won the 2018/2019 Speedway Sedans Western Australia Super Sedan State Title held last night at the Makit Hardware Narrogin Speedway. Pavlovich prevailed narrowly over Gary Higgs who finished runner up in the state title for the fifth time in his career with Busselton's Kevin Bell rounding out the podium. Warm Sunny conditions greeted competitors and spectators alike with Gary Higgs Sweet Chassis adjudged to be the Ian Beard Best Presented Car for the WA Super Sedan Title. 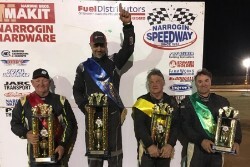 The defending WA Super Sedan Champion Warren Minshull from Broome dominated the opening heat race of the night defeating Tristan Green and Lee Aylett who finished third after moving through the field from position eight. Kevin Bell leading the second heat of the State Title from start to finish but was under intense pressure from Chris Pavlovich and Gary Higgs for the entire ten lap distance. Heat Three saw Warren Minshull and Steve Larson come together on the opening lap with Minshull falling back through the field. Pavlovich stormed around the outside of the field to win from Dean Shore and Terry Green who briefly came together on the final lap while battling for second place. Gary Higgs dominated Heat Four winning by a healthy margin from Adyme Harvey and Kevin Bell who was enjoying a consistent night. The final two heat races of the WA Super Sedan Title witnessed both Gary Higgs and Chris Pavlovich storm through the field in their respective outings giving them enough points to start on the front row for the A Main. Lee Ayletts suffered mechanical issues with his machine in the final heat race which prevented him from starting the main event. Tristan Green elected to use his Dad Terrys car for the State Final leaving thirteen cars to battle it out over the thirty five lap distance around the Makit Hardware Narrogin Speedway. Chris Pavlovich got the initial jump at the start of the A Main with Higgs and Bell quickly tucking in behind the leader. The first stoppage of the race occurred on lap eight when a couple of cars at the back of the field got together with them all able to restart. While running in fifth place Adrian Geary would spin backwards into turn three which saw him sent to the rear of the field. Defending Champion Warren Minshull would be out on lap thirteen after finding the wall in turn three while running in sixth place. Damo Wallinger was also out on lap thirteen as Pavlovich and Higgs moved away from the field after every stoppage. Gary Higgs tried everything to find a way past Pavlovich in the concluding stages with the two often racing side by side for lead. Pavlovich was equal to every challenge from Higgs with the Mount Barker based driver winning his first WA Super Sedan Title with Gary Higgs runner up for the fifth time in the event. Kevin Bell finished third once again in after having been third twice previously. Kalgoorlie's Dean Shore had a lonely race to finish fourth with Adyme Harvey rounding out the top five. It was a emotional moment for Chris Pavlovich as he thanked his sponsors and supporters for their long time support with the new state champion dedicating his win to his good friend Bert Vosbergen.